Here you have 5 reels to hunt down as much more prizes and also 100 paylines to hit roaring Free Spins, biting Multipliers and try to survive in the toothy Gamble Feature. 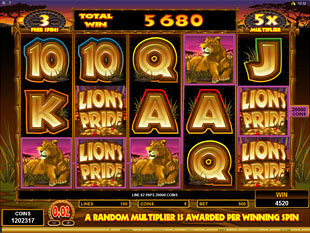 Unleash your animal instincts and play this ravenous cut-and-mouse game on the yellow landscapes of Africa right now! Here is something even faster, stronger and wilder than a lion… So, keep an eye out because on every reel Lion’s Pride Logo lies in wait for you to jump, attack and stack to bring you more rapacious money wins. Because the Logo is a wild symbol it can substitute all other regular icons in the game. Create more winning combos using the power of this Logo to gain more furious prizes! Mysterious and magic Mask is a scatter symbol that doesn’t afraid of Lion’s Pride Logo. Moreover, this symbol doesn’t conform to laws of nature and can activate bonus features or bring you high payouts in the teeth of activated paylines… Plus you can increase your total bet by 1x, 2x, 10x or even 100x Multiplier for 2, 3, 4 and 5 scatters caught anywhere on the reels respectively. Hunt and bite the most bloody prize of 1,250 coins with the highest bet of $10. So, if you want to catch the most tasteful prey then place the bet and spin the reels. The safari starts… Here you are free as wild animal to set up to 5 coins per line. Also you can choose the coin size between $0.01 and $0.02. 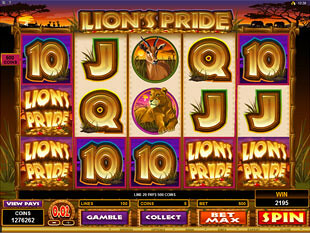 Herewith, if you pick the highest values you will bet 500 coins per spins and get the chance to hunt down the top jackpot of $125 for 5 Lion’s Pride Logos only… Are you brave enough for that? Gamble Feature. Risk, adrenalin and money prey… Rouse the animal in yourself and use the power to increase you winnings. 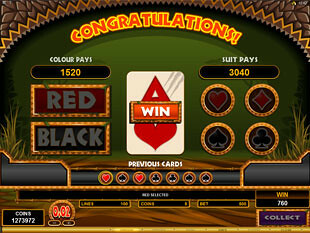 Gather any winning combo and try all-or-nothing Gamble Feature. Here you can turn couple of pennies into thousands of wins. 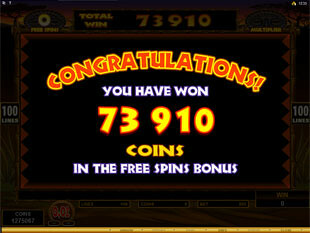 Free Spins Feature. Find at least three magic Masks on the reels of the slot and prize hunting will starts… Here you can get up to 25 Free Spins to catch more roaring coins. Moreover, here you can also get up to 10x Multiplier. So, each free spin can bring you different multiplier for your wins that can be as 2x, 3x, 5x or so desired 10x Multiplier… Plus you can prolong the hunting and re-trigger the bonus feature by catching 3, 4 or 5 Masks during Free Games. 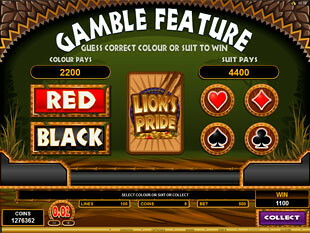 Let’s go for a wild emotions and predatory winnings at this free spins slots by Microgaming! 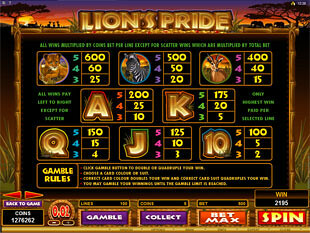 Face the lion and become the king of Lion’s Pride Slot Machine. Have you enough courage to do that?